Find out why misalignment of the cervical vertebrae may be responsible for a series of what seem to be unrelated conditions, the treatment of which focuses on suppressing the pain without correcting the cause. The 1st neck vertebra, known as Atlas or C1, plays the most primary role of the entire spine. A malfunction in this area can produce a "domino effect" on the entire musculoskeletal system, as well as the circulatory and nervous systems, creating imbalances and dysfunctions in various parts of the body. With time these dysfunctions can turn into more serious health problems. The body is then not able to function or repair as it should, which seriously affects the quality of your life. Medicine is not able to identify, diagnose, or treat this condition. 1. For many people a stressful birth process may have been the cause of cervical instability and misalignment. 2. Traumas such as whiplash or falls may also cause or further accentuate misalignment of the cervical vertebrae. For many it is merely fixed poor posture (sitting at a computer) for months or years that causes fixated misalignment in the spine. 3. 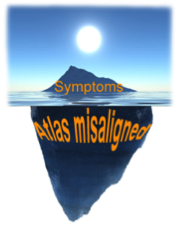 It has been found that misalignment spine is responsible for a number of disorders. Even problems in the lower body, like low back pain, lumbar disc herniation, and sciatica can have underlying causes in the cervical vertebrae. The entire spine is one unit, and if it is misaligned at the top, it will compensate in the lumbar spine as well. 4. Conventional medicine does not consider misalignment of the cervical vertebrae a possible cause of disorder in a patient. As a result this problem usually goes undiagnosed. 5. Failure to diagnose the problem is due to the fact that misalignment of the cervical vertebrae is not looked at by medical doctors, only fractures and severe dislocations are detected. 6. Leaving aside severe dislocations of the vertebrae requiring surgery, conventional medicine offers no treatment to correct the misalignment of the cervical vertebrae. 7. 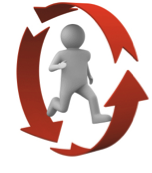 Often after the very first re-alignment/correction, patients begin feeling results. 8. Many consider adjusting the neck area is dangerous. Torque Release Technique uses an extremely gentle and low force instrument, instead of the hands, to carefully re-align cervical vertebrae. When the spine is in balance, weight is distributed evenly between the two sides of your skeleton. 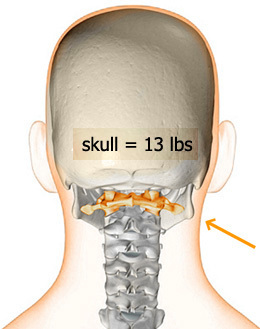 The weight of the head (as much as 16 lbs) is supported by the cervical spine. A slight misalignment can cause the skull to not sit perfectly on the cervical spine. This produces a shift in the body's center of gravity and therefore an imbalance from head to toe, leading to musculoskeletal dysfunction. This can causes a fixed false posture, in which one side of the body is more stressed than the other. This is also the reason why pain is generally concentrated on just one side. This continuous stress leads to the body's center of gravity being shifted. This causes muscle spasms and pain, especially if the muscles are weak and untrained. This results in cervical problems, tension-related headaches, vertigo, stiff neck and restricted or painful head rotation. 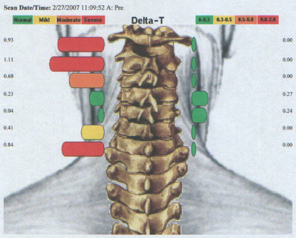 In a chain-reaction process, a misalignment of the cervical spine causes asymmetries of the entire skeleton, such as one shoulder being higher than the other potentially causing pain in the back, neck, tilted pelvis with consequent danger of herniated discs, and pain in the hips and even knees. As long as postural defects exist, permanent muscular tension develops which, as well as being painful, can cause other vertebrae in the spine to misalign. The resulting misalignment may create persistent compression on spinal nerve roots. More and more frequently doctors use cortisone against those irritations, which is indeed a useful medication for temporary relief, but causes severe, well noted side effects in the long term and quicker degeneration of the spinal discs, in turn leading more likely to surgery. 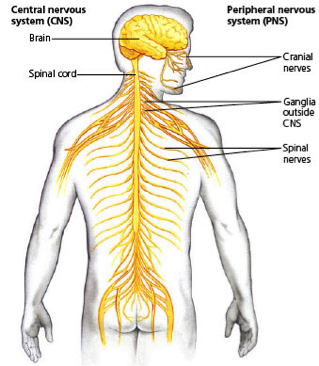 Compression of certain nerves leads to feelings of pins and needles, numbness or pain in the arms or legs, while the pressure put on other nerves leads to malfunctions in the corresponding organs. This gives rise to a series of disturbances, even in apparently unrelated areas of the body. Examples could be related to digestion, menstrual cycle, migraines, energy or focus, constipation, or sleep disorder. Have you been told by your doctor that your problems are probably of a psychosomatic origin? It is quite likely that your doctor doesn't know – and therefore cannot tell you that a misaligned cervical spine might be the cause of your health problems. Chronic complaints of neck and back pain, stiffness, restricted range of motion, migraine attacks or headaches, and deeper spinal conditions related to the discs often find a simple, logical explanation in cervical misalignment. Correction of this problem offers a real, lasting solution without being forced to take medication continuously with ensuing side effects. In addition, correction of the cervical vertebrae is the ideal method to improve posture, thus preventing postural defects such as a tilted pelvis, or the common upper back hump with aging. Receive effective and gentle care from chronic pain expert Dr. Mike Headlee who uses a non-surgical, non-invasive technique to get great results in patients who suffer from neck and back pain (including herniated disks, neck and back strains, pinched nerves and chronic muscle tension), headaches and sleep disorders. Explore Chiropractic focuses on correcting the underlying cause of your health concerns, rather than masking the symptoms or providing just short term relief that doesn't last. 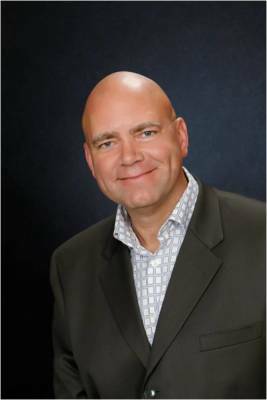 Dr. Headlee practices one of the newest chiropractic approaches, using a gentle instrument rather than forceful manipulation. Expect results to be achieved faster than with conventional care - saving you time and money.